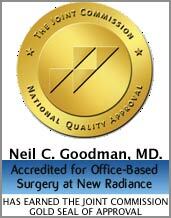 New Radiance Cosmetic Center of Palm Beach is the primary office of Board certified Surgeon Neil C. Goodman and Plastic Surgeon Avon Lipschitz and is a full-service cosmetic center dedicated to bringing you the most complete and advanced selection of cosmetic and aesthetics procedures in Palm Beach County. Aside from New Radiance’s talented and experienced staff of top cosmetic physicians, estheticians and injectors, we boast the most advanced technology in the skin rejuvenation and non-invasive body contouring industries. We also sell health and beauty products, from skin care to energy boosters and weight management products, that complement our quality cosmetic services. Located in the heart of Palm Beach Gardens, New Radiance Cosmetic Center is a not only a convenient location for residents of Palm Beach County, but for those outside of the area where the quality and quantity of the services we provide are scarce.